Hofstra Men’s Club Lacrosse won the New York Metro Conference Championship and a trip to the Sweet Sixteen with an emphatic 14-4 victory over Fordham on Wednesday, April 22nd. A raucous Shuart Stadium set the scene for the squad's final conference fixture, in which Joseph Baker netted five goals. Martin Beer and Dylan Wills also registered multi-goal games, each notching two, while Ryan Cook, Sam Juris, Bodie Pate, Greg Stengel, and Dennis Costa took the tally to 14 with one goal a piece. Brad Griminger and Amit Nath both had assists. The team traveled to Rutgers University on Saturday, April 25th, with the prospect of a win placing them in the Elite 8. Unfortunately, despite a hat-trick from Moner Mosa, and goals from Joe Baker, Ryan Cook, and Dylan Wills, Rutgers advanced with a 12-6 win, bringing the Pride’s exciting season to a end. Hofstra Men’s Club Soccer had their second game of the season on Saturday, April 25th, making the short trip to take on local rivals Stony Brook. Chibuzo Nwosu broke the deadlock and gave the Pride a 1-0 lead at halftime, but a second half surge from the opposition ended the match 4-1. Hofstra Women’s Club Soccer had better luck, and topped off a sunny Sunday morning with a 2-1 win over Adelphi on April 26th. 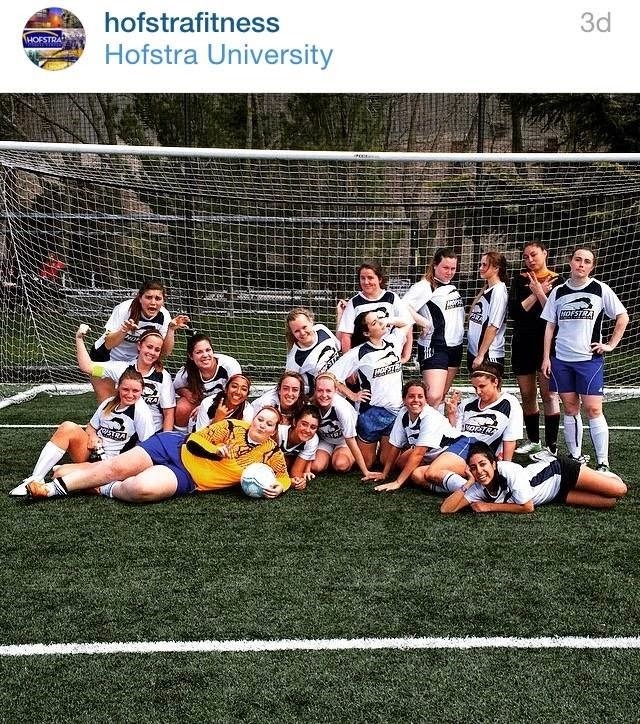 Hofstra Women's Club Soccer after their 2-1 win over Adelphi. Hofstra Club Baseball traveled down to Towson University on Saturday, April 25th for a weekend series against the Tigers. The Pride fell short 12-8 in game one, but showed great resilience to turn their fortunes around, winning the next two games 10-9 and 7-2. Justin Cusano and Joe Zapata both impressed from the mound, each securing a complete game win. Nick Cavallino went 4-10 with a double, two RBIS, three runs, and a walk. Aaron Brown went 5-10 with a pair of doubles, two RBIs, four runs, a stolen base and two walks. Thanks to this latest victory, the club remains in the running for a spot in the North Atlantic Regional Playoffs. With the 2014-2015 season coming to a close, Hofstra Quidditch took second in the Big Apple Quidditch Conference Tournament. The conference is made up of ten teams from the tri-state area, including NYU, Stony Brook, and New Haven. The team will next be in action on Saturday, May 9th in the Mercenary Tournament on the Hofstra Intramural fields. 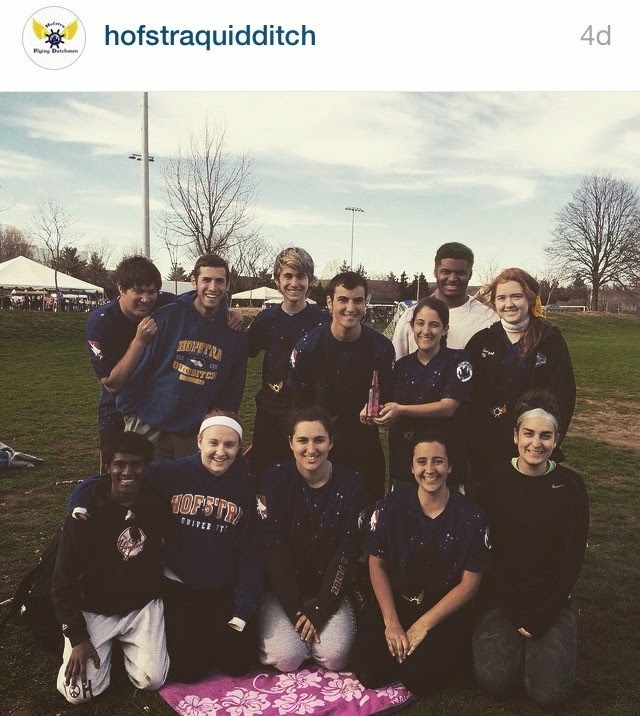 Hofstra Quidditch celebrates their 2nd place performance in the Big Apple Quidditch Conference Tournament. Hofstra Women’s Rugby Club hosted the Gohring Tournament on Saturday, April 25th, which included an Alumni team and LIU Brooklyn. The highlight of the day was the Pride's thrilling 17-14 victory over LIU Brooklyn. 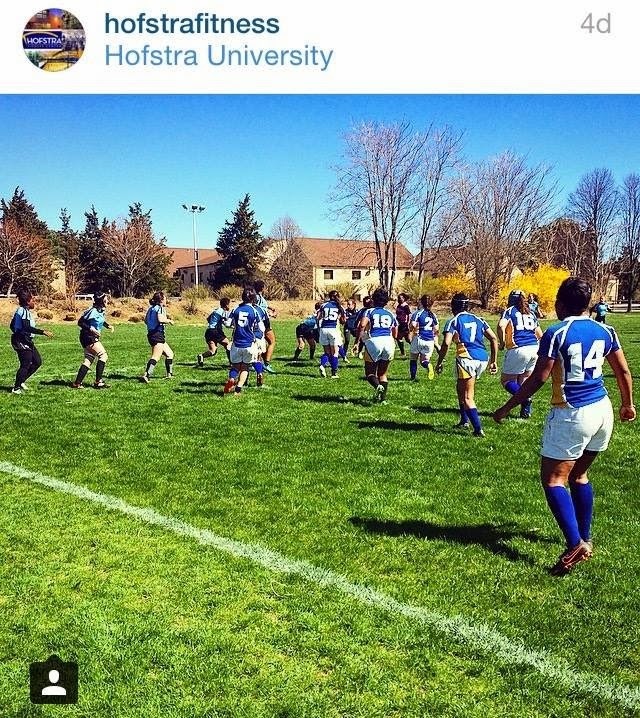 Hofstra Women's Rugby Club in action in the Gohring Tournament held on the Intramural Rugby Field.